The chocolate chip cookie recipe from the New York Times has been making the rounds of several blogs, including Orangette and Cookie Madness. In the accompanying article, they essentially call it the perfect recipe. I deviated slightly from the recipe, I used regular chips and my scoop was somewhat smaller at 3 Tablespoons, resulting in 3 inch instead of 5 inch cookies. I baked these on 3 separate days. The first was after 24 hours resting, the 2nd was after 48 hrs resting and the third was refrigerated for the 48 hrs, scooped, then frozen for 4 days, warmed to room temperature for ~8 hours and then baked. Except for the batch I forgot the put the salt on the top of, these all tasted the same. I prefer warm cookies and baking them on 3 separate occasions certainly gave me ample opportunity to sample the warm cookies, which are quite tasty. I thought these cookes were good, solid cookies and I enjoyed eating them. I’m not sure I would call them perfect, but the salt was a nice touch. I might try them again with a higher quality chocolate chip, and slightly larger in size, but I am not sure if this will become my go-to chocolate chip cookie recipe. There are so many other chocolate chip cookie recipe options I want to try, but I think I will rest the dough, if I have the time (and the patience to wait that long for cookies). Added on 7/25/08. Two other related links recently came to my attention. The King Arthur Flour Blog calls the NYT out for their “pinch of pretension”. 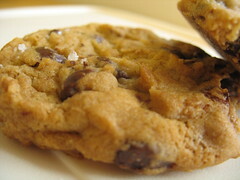 Dessert First compares several versions of chocolate chip cookies. I don’t care where the receipe came from, you should sell these. LOVED THESE. I don’t care where the recipe came from, you should sell these.